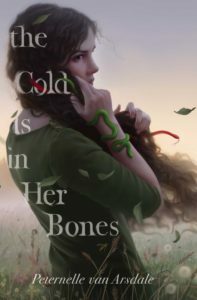 If you love the idea of a Medusa re-telling, then The Cold is in Her Bones is for you. It’s not a re-telling in the sense that you might think, but it deals with monstrous women in the best of ways. Disclaimer: I received this book as an advance copy from Edelweiss. This does not effect my review as it is honest and unbiased. The Cold is in Her Bones was fabulous. There’s so much to talk about because it’s a book about family, sisterhood, and vengeance. I haven’t read something like this in such a long time and it made me feel like I did after The Hollow Girl. With added layers, there’s so much to unpack here – the confines of femininity, the fear and punishment of women, the danger of holding onto anger, and the necessity for love and compassion. It’s a book that has threads of medusa, but also about the way we cling to vengeance, are caught up in a laundry machine of anger and pain, until we raze it to the ground. There was so much I adored about The Cold is in Her Bones. But what really swept me away in the book is the combination of themes with the plot of the book. This society really functions on policing and punishing women’s behavior, specifically girls. There’s this idea that we should be obedient so that we do not invite the devil into us. And if we do, then we will be sent away, mourned as if dead, and never to be seen again. It’s a culture of fear and silence. And it’s particularly raw for Mila who grows up outside the village and so does not know what happens to village girls, or why Iris has come to stay. In many ways, Mila’s behavior begins just by breaking free of what is determined as obedient and feminine. She enjoys playing in the dirt, the outdoors, and has a hard time being obedient, all while feeling like she is disappointing her parents. Because there’s a secret in her world. One that everyone else seems to know, but she. The mystery and lies only increase as Iris is brought to their outskirts, and no one wants to tell Mila the truth, except Iris. And then halfway through the book, the story takes a whole new turn. I can’t even talk about it without spoiling you all of the exquisite joy. But the story begins to be less about Mila and more a story about forgiveness and vengeance. It becomes about when we have been hurt, and are stuck in a cycle of pain and revenge. Our heart becomes too hard, too painful, and we become obsessed with seeing others hurt the same way. While in reality, the only thing that can set us free is forgiveness, the truth. When you reach that point, The Cold is in Her Bones really begins to evoke Medua imagery, of a world that has wronged women, punished them, and now fear them. And everything you think you knew, becomes even richer. The Cold is in Her Bones, which was always a book about secrecy, becomes one about truth. A book about family, and the ways they can hurt us, becomes one about found family, about choosing love and the relationships that nourish us. Find The Cold is in Her Bones on Goodreads, Amazon, Indiebound & The Book Depository. What is your favorite Greek mythology retelling? I really adored Circe! Wowowow!!! I need to read this ASAP. Circe is one of my all time faves and now the way you described this book makes me want to read it so bad! Lovely review. YAS! I thought the comparison was pretty good once I heard it!